	The equatorial Pacific remains in officially declared El Niño conditions, with the warmest anomalies relative to normal in the central rather than the eastern Pacific, as has been the case since last fall. Atmospheric confirmation signals in trade winds and global circulation patterns are present but weak. marking an El Niño event. Given significant warmth with depth in the Pacific, continuation of weak El Niño is most likely over the next several months. 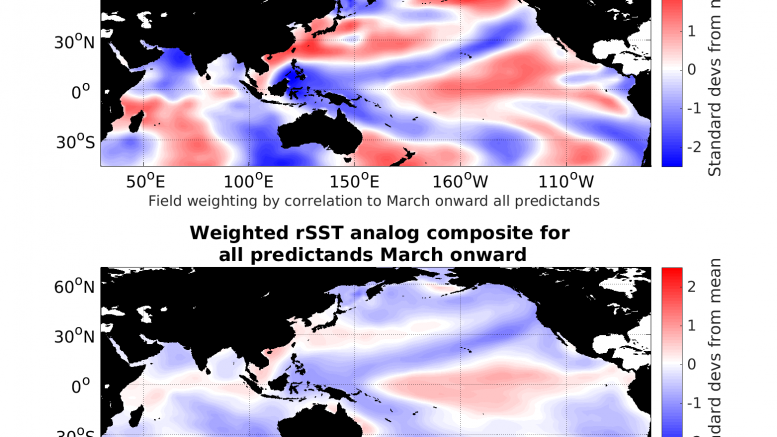 The equatorial Pacific is in a neutral state, with atmospheric measures of ENSO divided between Niña and Niño-like patterns. WeatherTiger’s proprietary ENSO Whisperer is a little quicker to move the Pacific towards a weak El Niño, with the development of a weak or moderate +ENSO over the fall and winter of 2018 continues to be our preferred forecast solution.